Podcast Episode 76 — How to Recognize and Avoid Complacency In Leadership! Hello, and welcome to the Leadership Done Right Podcast, Episode 76: How to Recognize and Avoid Complacency In Leadership! Hi friends! There’s a lot of people that start out their careers with all the motivation in the world to become great leaders. They want to change the world and start out working hard to be great. For the first few years or even longer, they hit the ground running. As years begin to pass, the motivation starts to slip and all the dreams of success and changing the world fade. The drive to make every day count fades. The new desire is to do what it takes to get through each day, but then leave as soon as they can to enjoy life. Their strong dedication gets replaced with a very common disease. Now this is a very serious disease. I have seen great people get infected with this disease to where it completely derailed their career drive. In the worst cases, this disease can lead to the loss of jobs. If you are still wondering what this terrible disease is, I like to call it complacency. In this episode, I am going to talk about three things that happen when complacency sets in and five tips to overcome complacency. Before we get to that, do you want to become a better leader? If you do, I can help you take your leadership to the next level! I have some leadership coaching sessions available for a limited time just for you! In these coaching sessions, I’ll help you accelerate your career, leadership, and life so you can take your leadership to the next level. In these coaching sessions, we’ll discuss how you can improve yourself and your leadership. We’ll help you develop and complete challenging goals through proven goal setting strategies, and create and refine your personal development plan. In addition, I’ll guide you through leadership training to refine your communication, time management, teamwork and other leadership skills. If you want to become a great leader today, send me a quick email at brandonwjones@leadershipdoneright.com, or message me on Facebook, LinkedIn, or twitter to let me know that you’d like to schedule your free coaching session today! What Happens When Complacency Sets In? Alright, let’s talk about what happens when complacency sets in. Several years ago, I had a great leader, Larry Spackman. He taught me a valuable lesson about complacency. He was very successful in everything he did and attributed his success to his strong drive and unrelenting desire to never back down when working to complete his goals. When I was around him, he always stressed the importance of working hard and doing your very best. In addition, he lived what he taught. Because he was so driven, he despised complacency. He taught that complacency would keep you from reaching your dreams and goals. Larry taught me to avoid complacency at all cost and his example confirmed the validity of what taught. There are three major side effects that come with a complacent attitude. [Read more…] about Podcast Episode 76 — How to Recognize and Avoid Complacency In Leadership! Hello, and welcome to the Leadership Done Right Podcast, Episode 32: Start with Purpose with Dr. Frumi Rachel Barr. Our guest today is truly an entrepreneur having started and run 5 entrepreneurial adventures prior to following her passion for guiding the success of CEOs and their teams to Scale Up. She lives her “WHY” (purpose or cause) daily: creating a safe environment for leaders and their teams to talk about the tough issues that matter most to build profitable and sustainable organizations. She has a unique approach. She always begins with culture – the competitive advantage of any company. Building ridiculously successful businesses is what it’s all about. 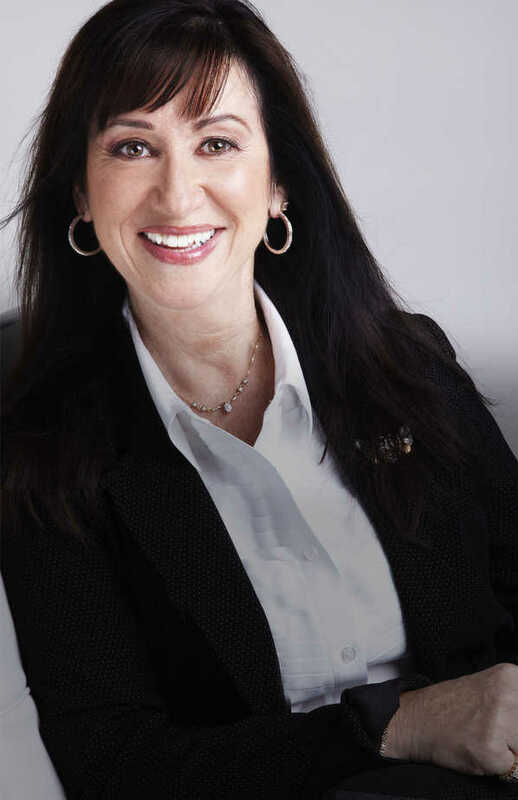 She is the author of A CEO’s Secret Weapon: How to Accelerate Success. The book was ranked top business book of 2012 by ExecRank and has a forward by her colleague Simon Sinek, international author of bestselling Start with Why. I am honored and humbled to have her on the show today. Our guest is Dr. Frumi Rachel Barr. Name, welcome to the show! When you hire the right people, you have smart people on your team. Leadership is really about having followers, knowing why you do what you do, and inspiring people. When you are a leader, you are required to attend a lot of meetings. You have management meetings, planning meetings, training meetings, project meetings, etc. The list goes on… meetings, meetings, meetings… Sometimes they are very effective meetings and other times they are almost a complete waste of time. 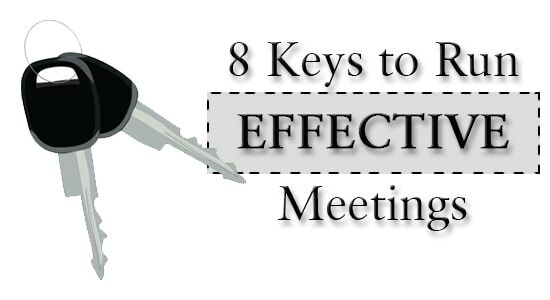 So what does it take to have effective meetings? Before getting people together in a meeting, understand the value of people’s time. People are busy and have many important responsibilities they must address on a regular basis. Be considerate of others’ time and the many things they have to do. Hi, and welcome to the Leadership Done Right YouTube channel. One leadership quality that has become less and less popular is humility. People feel like in order to compete in the business world they have to be strong, competitive, and anything but humble. Humility is looked at, in many cases, as a weakness. I believe, however, that humility is a leadership strength. 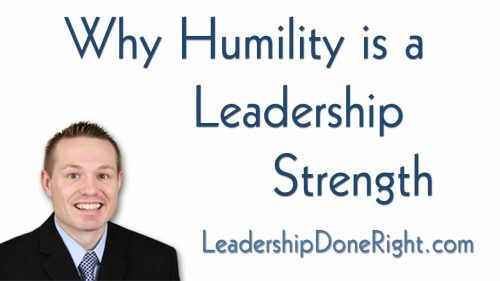 I would like to suggest four reasons why humility is a leadership strength and not a weakness. Insecurity happens when you are not secure in yourself or your beliefs. You lack an understanding of your purpose or value. When you are humble, however, you are not insecure. You understand yourself, your beliefs, and the unique value you provide. Hello and welcome to the Leadership Done Right Podcast, Episode 6 – How to Develop Confidence and Influence. This is one of my favorite quotes from Marianne Williamson and then later used by Nelson Mendela. Our deepest fear is not that we are inadequate. Our deepest fear is that we are powerful beyond measure. It is our light, not our darkness that most frightens us. We ask ourselves, Who am I to be brilliant, gorgeous, talented, fabulous? Actually, who are you not to be? You are a child of God. Your playing small does not serve the world. There is nothing enlightened about shrinking so that other people won’t feel insecure around you. We are all meant to shine, as children do. And as we let our own light shine, we unconsciously give other people permission to do the same. As we are liberated from our own fear, our presence automatically liberates others.